August 7, 2016 3 comments on "Canning Plum Jelly"
If you or someone you know has a plum tree, then you are probably trying to decide what to do with all those plums! I’ve tried making plum jam and spiced plum jam before, but for some reason my family doesn’t like all the big chunks of plums in the jam. So this year I decided to try canning plum jelly. 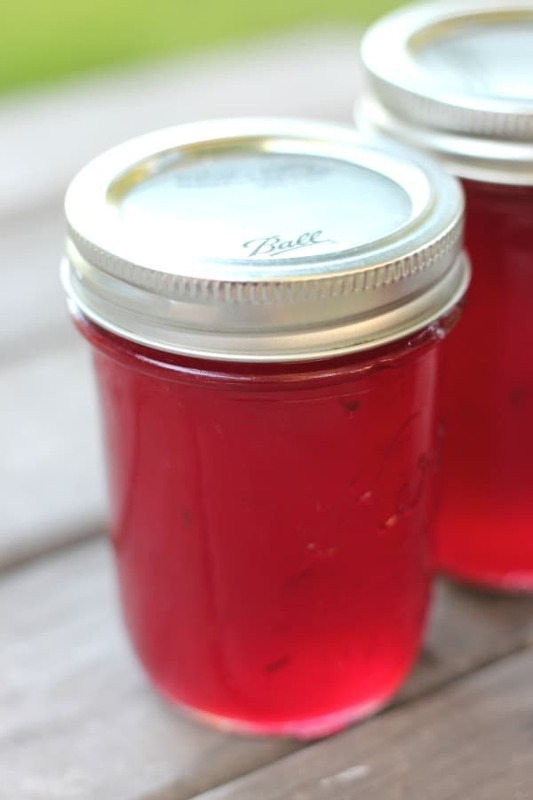 Plum jelly is now one of my favorite top 10 easy homemade jelly recipes. New to water boiling canning? The video below will show you how to make plum jelly, step by step. Wash and chop plums, removing pits. There is no need to peel them. Place plums in large stock pot with about 1 c. water to keep plums to sticking to bottom of pot. Bring to boil and simmer for about 10 minutes, or until plums are soft. Extract juice from plums with a jelly bag or fine mesh strainer. Measure juice, adding a little water if necessary to get exactly 5 cups of juice. Pour plum juice into a large stock pot. Sprinkle the pectin on top of the juice and use a whisk to mix it together. Stirring constantly, heat until boiling. Boil for one minute. Remove the pan from the heat. Remove any foam with a metal spoon. Ladle the jelly into hot sterilized jars, leaving ¼ inch head space. You can easily measure the head space with this inexpensive canning funnel. Place the sterilized canning lids and rings on the jars and screw the rings on finger tight. Place the jars in the boiling water canner that is filled about half way with water. Jars should be covered with at least 1 inch of water. Bring the water to a boil and process the jars for 5 minutes. Remove the jars from the canner and place on a towel on the kitchen counter to cool. Place any unsealed jars in the refrigerator to eat in the next couple weeks. Sealed jars can be stored in the pantry for 1-2 years. 3 Comments on "Canning Plum Jelly"
When I boil down my plums they are sweet enough. Do I still need all that sugar? Hi! If you are cooking plum jam and not using pectin, it is fine to boil the plums down without using the extra sugar. 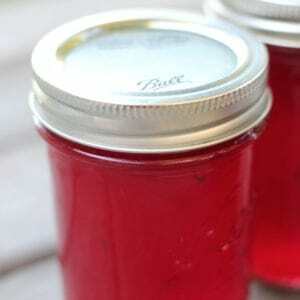 For this plum jelly recipe, the sugar is needed to make the pectin work to thicken the jelly. Thank you for a simple educational that’s easy to use and works.